ABU DHABI, United Arab Emirates, Oct. 30, 2018 – His Highness Sheikh Mohamed bin Zayed Al Nahyan, Crown Prince of Abu Dhabi and Deputy Supreme Commander of the UAE Armed Forces, hosted and welcomed to his home a delegation of American Evangelical Christian leaders. The group, led by Joel C. Rosenberg, had four days of open dialogue and discussion with senior government officials and religious leaders, both Muslim and Christian. His Highness Sheikh Mohamed bin Zayed Al Nahyan, Crown Prince of Abu Dhabi (center), welcomes a delegation of American Evangelicals, including Joel C. Rosenberg (on couch, left) and Rev. Johnnie Moore (on couch, right), into his home. The Crown Prince invited the group to come to the Emirates to see the country’s extraordinary economic and social innovation; learn about their emphasis on tolerance, inclusion and moderation, and protection of freedom to worship; and openly discuss the most urgent and sensitive issues of the day, such as the threats posed by Iran and the Muslim Brotherhood and the prospects for regional peace. Sheikh Mohamed was born in a hospital started and run by Evangelical medical missionaries in the Gulf, which is still operated by Christians, without regard for patients’ faith or background, after more than 60 years. As a result, the UAE is a more tolerant nation, where Evangelicals — and all Christians — are allowed to worship freely. The delegation began the more than two-hour discussion, originally scheduled for 30-minutes, by thanking the Crown Prince for his protection of freedom of worship for minority faiths in his majority Muslim nation; his strong alliance with the United States and moral clarity in countering violent extremism; and leadership to foster economic innovation, prosperity and security in his nation and the region. Rosenberg noted that the group’s purpose in coming was to build relational bridges of friendship and thanked the Sheikh Mohamed for all he is doing to carry on the work started by his late father, Sheikh Zayed bin Sultan Al Nahyan, “Father of the Nation” and the first President of the UAE. Rev. Johnnie Moore noted that Muslims and Evangelicals in the Middle East have more in common in terms of values and priorities than is often realized. “But I think that actually, we are the best allies and are becoming the best of friends,” he said. “We are living in a rare moment, a window of opportunity for leaders of goodwill – Muslims, Jews and Christians – to actually achieve the peace for which we have only hoped and prayed until now – including peace between Arabs and Israel,” said Michele Bachmann, former Member of the U.S. Congress who served on the U.S. House Finance and Intelligence committees. During the visit, the delegation also met with His Highness Abdullah bin Zayed Al Nahyan, UAE Minister of Foreign Affairs and International Cooperation and brother to the Crown Prince; His Excellency Sheikh Nahyan bin Mubarak Al Nahyan, Minister of State for Tolerance; His Excellency Maqsoud Kruse, Executive Director Hedayah; and officials from the Sawab Center, a joint initiative between the governments of the UAE and U.S. in support of the Global Coalition against ISIS. “The UAE is aggressively working to combat extremism in the Middle East and beyond. Their leadership is encouraging,” said Tony Perkins, president of the Family Research Council. 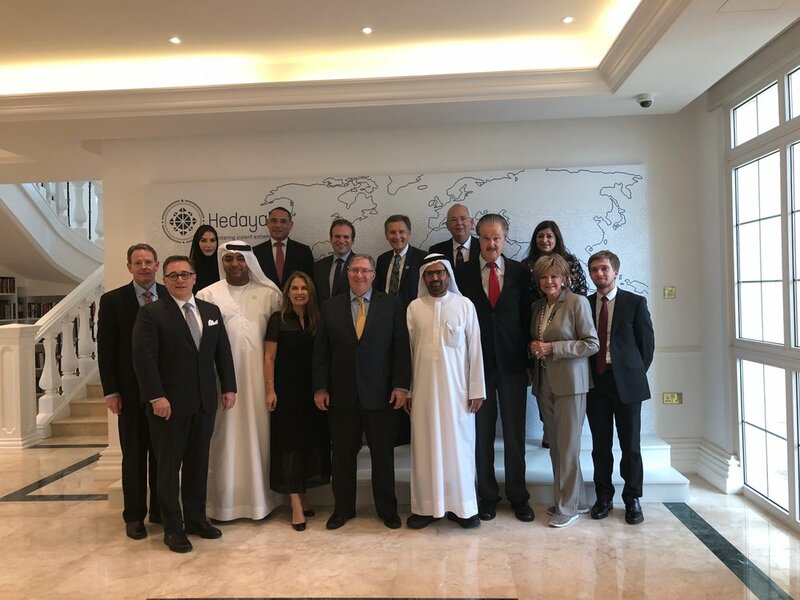 The American Evangelical delegation meets with His Excellency Maqsoud Kruse, executive director Hedayah, and his team in Abu Dhabi. The group also met with His Excellency Sheikh Nahyan bin Mubarak Al Nahyan, Minister of State for Tolerance. “It is important that we go beyond mere tolerance, to understand, believe in and live with one another,” he said. Members of the delegation hosted by Rosenberg include former U.S. Congresswoman Michele Bachmann; Tony Perkins, president of the Family Research Council and Rev. Johnnie Moore, founder of The Kairos Company – both of whom serve as Commissioners with the U.S. Commission on International Religious Freedom; Larry Ross, founder of A. Larry Ross Communications in Texas; Dr. Mike Evans, founder of the Jerusalem Prayer Team; Dr. Jerry Johnson, president and CEO of National Religious Broadcasters (NRB); Michael D. Little, former president and CEO of The Christian Broadcasting Network; Ms. Kay Arthur, renowned Bible teacher and founder of Precepts Ministries International; and Pastor Skip Heitzig, senior pastor of Calvary Albuquerque in New Mexico; and Wayne Pederson, former president and CEO of the NRB and former president of Reach Beyond radio ministry.